Leather is a favorite choice when it comes to accessories like handbags. Leathers are prime choices for bookbags as well, and there are several advantages to this material. Leather is durable and long lasting. Rather than detracting from the look of good leather, regular use results in a unique patina that adds character. A leather backpack is also a good choice stylistically for professionals and adult students, because it offers a sleeker, more sophisticated look than many canvas or fabric bookbags. Mini sized backpacks are versatile and a great choice for busy women. The popular packs offer hands-free ease and typically offer internal and external pockets as organizational features. Leather mini bookbags or backpack purses are roomy enough for essentials (and often a few extra items!) but compact enough to be a great alternative to the standard handbag. The buckle -accented Leather Mini Bookbag from Amerileather has padded shoulder straps for extra comfort, a flap and cinch string closure, and roomy exterior pockets. Available in black or brown. The simple, square design Lodis Audrey Mini Backpack is available in a pulse-racing red or mysterious black at Endless. Crazy for Chanel? Rent the vintage Chanel mini bookbag in black pebbled leather from Bag Borrow or Steal. 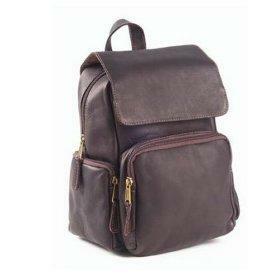 Many leather style bookbags are available in unisex designs. From simple, functional designs for students to designer bookbags, the lure of lovely leather extends itself to hundreds of larger styles as well. If you need to carry textbooks or other items of specific size, check the sizing of the bag; some styles are larger than minis, but don't have as much carrying capacity of other styles. There are many unisex styles available, as well as specifically feminine and masculine designs. In addition to their versatile Original Leather Bookbag, Custom Hide offers a full range of sturdy unisex styles, from professional laptop backpacks to slimline styles all in heavy-duty full grain leather. With a slightly rugged, but still professional masculine look, the Duluth Messenger Style Bookbag is perfect for the man looking for function and style. Available in hand cut brown leather. Louis Vuitton fans can check out the sleek black Mabillon in epi leather, and stylish Soho with multi-toned leather on the LV online catalog. Choosing the right size and style bookbag may take a bit of decision making. With all the great options available today, you're sure to find a leather bookbag that combines both style and function, as well as the features you need for work, school, or travel.